Manufacturer of a wide range of products which include fire alarm system, smoke detector and manual call point. 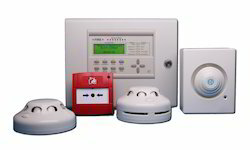 A fire alarm system has a number of devices working together to detect and warn people through visual and audio appliances when smoke, fire, carbon monoxide or other emergencies are present. These alarms may be activated automatically from smoke detectors, and heat detectors or may also be activated via manual fire alarm activation devices such as manual call points or pull stations. Alarms can be either motorized bells or wall mountable sounders or horns. They can also be speaker strobes which sound an alarm, followed by a voice evacuation message which warns people inside the building not to use the elevators. Fire alarm sounders can be set to certain frequencies and different tones including low, medium and high, depending on the country and manufacturer of the device. Most fire alarm systems in Europe sound like a siren with alternating frequencies. 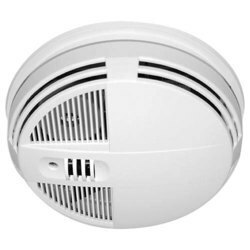 Smoke Detector has enabled us to gain a name of trust in the market in the present scenario. A smoke detector is a device that senses smoke, typically as an indicator of fire. Manual Alarm Call Points. 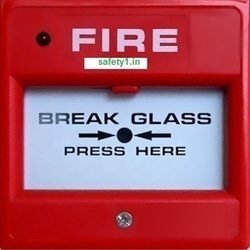 Manual alarm call points are designed for the purpose of raising an alarm manually once verification of a fire or emergency condition exists, by operating the push button or break glass the alarm signal can be raised.